The rich, fascinating and debated history of our favourite ‘toy’ can be found by perusing the various sites listed below. Wikipedia has an excellent page on the History of Playing Cards. What kind of Cards are used in casinos? – Most casinos use cards that are 100% plastic. Unlike the paper cards you probably use at your weekly bridge games, plastic allows the cards to be used for more hands before being swapped out, especially in games like poker where card-handling by players is much more frequent. Plastic cards also provide additional security as they make it more difficult for players to mark than their paper counterparts. Although the most commonly used cards these days are made out of pixels! Many people play on online casinos which is more convenient and comfortable but you miss part of the experience of casino gaming. A Brief History of Playing Cards – Playing Cards have existed for millennia and around them hundreds of games and conventions have been devised. It is upon their fall, their suits and their ranks that fortunes have been dashed and players been daunted. The standard deck comprises 52 cards, in four suits each of thirteen ranks. In the Royal Household are Kings, Queens and Jacks, and another fellow who plays a cameo in games here and there known as the Joker. The English pattern itself derives from a 15th century design that originated in Rouen, France. One might not think twice as to why it is these characters who have come to contritely inhabit the ranks of the deck. Their place in playing cards was by no means a journey of certainty, and it was not without the possibility of other contenders. But it was these Kings, Queens and Knights, this English household, dressed in their 16th century period garb that underwrites the standard of the Anglo-American playing card. Their history begins way back in the murky dimness when many patterns were emerging in regions, and when many different Royal Households contended for eminence. It is believed the history of black jack cards is tied to the Romans who are said to have played the game with wooden blocks of different numerical values. This theory holds some weight as Romans loved gambling, but that by no means confirms the theory. No discussion of the ‘devil’s picturebook’ would be complete without learning how playing cards are made. How Products Are Made website gives a great history and shows how cards are made, today and in history. Here’s an Interesting newsy bit from 2011 but I haven’t been able to locate the original article. 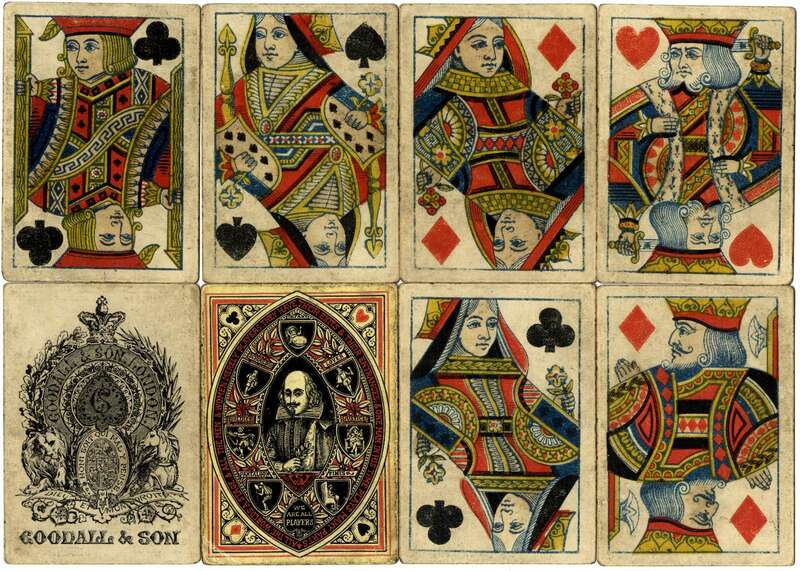 Archivist uncovers 500-year-old playing cards. 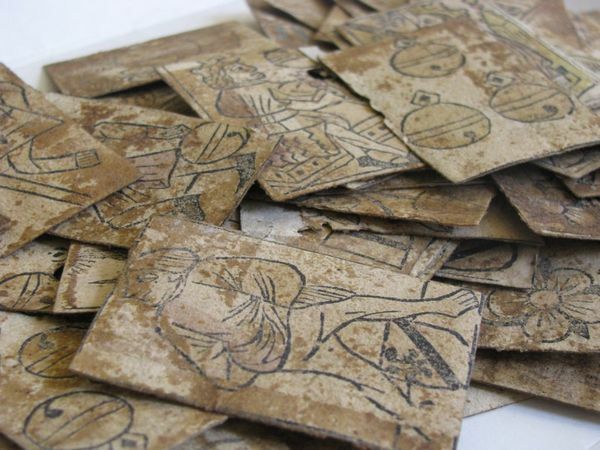 While restoring the cover of a medieval court record, he uncovered 90 playing cards dating from 500 years ago. The chance find is only four cards shy of a complete set. And the discovery is one of only a handful to yield a group of so many cards of this vintage for a game seen as a predecessor to one of Switzerland’s national pastimes. . . . The cards probably date from 16th century Basel.